The Pound fell hard during yesterday’s session after the odds of a hard Brexit increased substantially. Reports came out saying that the EU could grant the UK an extension up to May 22, not June 30 as PM May hoped, but that happens only in the case MPs approve a withdrawal agreement next week. The Sterling sold-off on this news, as nor May, neither MPs are willing to change their stances. In economic news, the UK unveiled its much better Retail Sales data coming at 4.0% vs 3.3%. Also, BoE maintained its monetary policy unchanged as expected. Today, there are no relevant UK data on the calendar, so the main focus will remain on any further Brexit development. 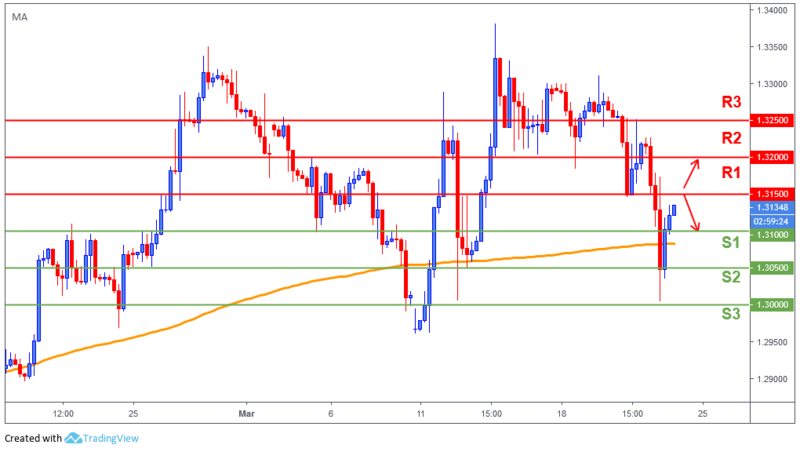 The Pound collapsed more than 200 pips yesterday once price broke below 1.3150, which the market is currently trying to retest it as a resistance. A break above 1.3150 (R1), we could likely see a continuation towards 1.32. Alternatively, a break below 1.31 could open doors for further weakness on this pair.